The International English Language Testing System [IELTS] Was Introduced In 1989 to help universities and colleges assess the English skills of applicants wishing to study or train in the English language it continues to be used for this purpose and is also used used as as a general test of English for immigration and employment in many countries. Candidates must choose to sit either the Academic or the General training IELTS test. The Academic IELTS test is for individuals who plan to study in English at university [undergraduate or postgraduate level] and is designed to test the understading and use of complex academic language. The General Training IELTS test is suitable for individuals requiring a more general level of English proficiency for college,high school,employment or immigration purpose. 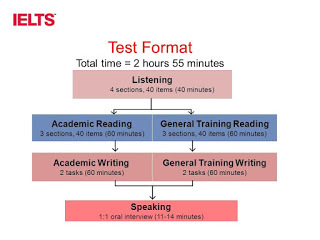 The IELTS test is divided into four sections: Listening, Reading, Writing and Speaking. All candidates sit the same Listening ang Speaking test. However, Academic and General Training candidates each sit a different Reading and Writing test. There is no pass or fail mark in the IELTS test. Candidate’s are marked on a band scale of 1 to 9 in each part of the test. These band classify a candidate’s ability to use and and understand English in particular contexts, and correspond approximately to the categories of English Proficiency as listed below. The Test Results From [TRF] contains a score for each part of the test as well as an average [overall] band score. Depending on various English language requirements, individual universities, organisation and countries decide which IELTS band score is suitable for their applicants.